MetroPlex™ is an effective and safe treatment for several protozoan and anaerobic bacterial diseases of fish (Cryptocaryon, Hexamita, Ichthyophthirius). It does not adversely affect the filter bed and is easily removed with carbon. There is little danger of overdosing. Usual dose is 125 mg/10 gallons. 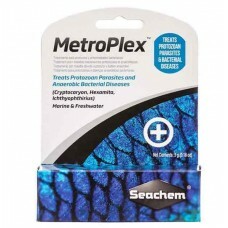 This is a perfect product for anyone with an aquarium with a severe bacterial out brake. DIRECTIONS: Use 1-2 measures (included) for every 40 L (10 US gallons). Repeat every 2 days for up to 3 weeks or until symptoms disappear. Turn off UV, ozone, and chemical filtration. To feed, blend 1 measure with about 1 tablespoon of frozen food paste. To minimize loss during feeding use with Focus™. To enhance palatability use with GarlicGuard™ or Entice™. Food may be refrozen.